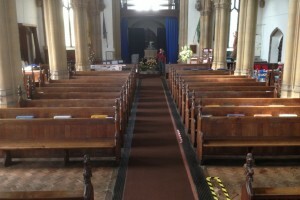 Skillingtons have just been awarded the contract for re-flooring St. Nicholas church at Wells, on the north Norfolk coast. The existing floor of hard plain quarry tiles and (mainly) woodblock, all laid on concrete in the 19th century, has been giving problems for years, particularly with the wood rotting. Having won the work by competitive tender we have been working with the client to design a suitable layout of Ancaster Weatherbed flagstones in the nave, aisles and Lady Chapel – in total about 400m2. We have also been looking at a finish that combines a high enough degree of polish whilst achieving sufficient slip resistance. The work commences in July and will take about 20 weeks.